Overall size: 23" x 27"
Bill Reid V.C. and Norman Jackson V.C. 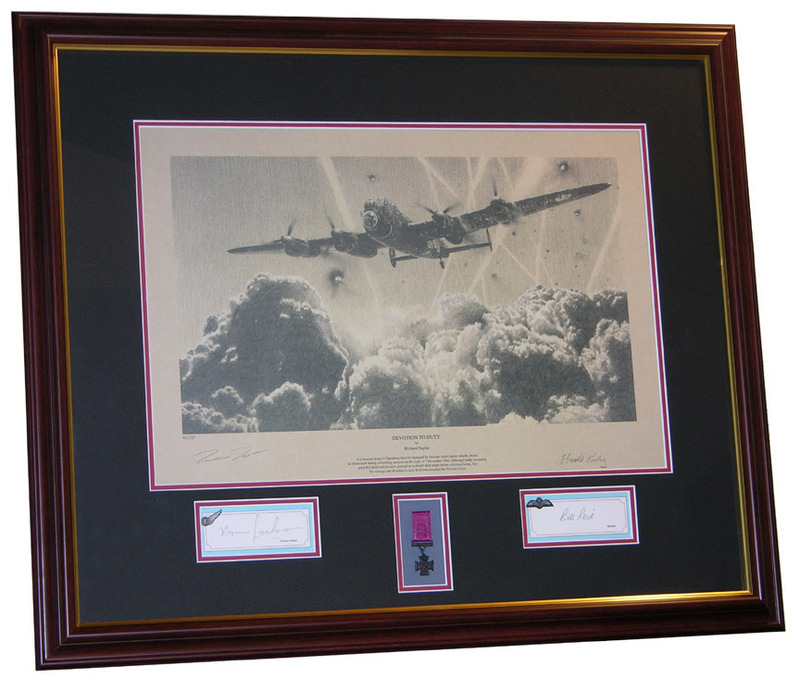 The signed print is double matted and framed to include the autographs of Bill Reid V.C. and Norman Jackson V.C. and a miniature reproduction of the Victoria Cross. All materials and methods used in the matting meet the highest conservation standards. The piece is completed with a top quality Mahogany finish wood frame with gold accent and ultraviolet filtering plexiglass, providing maximum protection against fading. in a raid on Mönchengladbach. In September he was posted to 61 Squadron at RAF Syerston, Newark, to commence Lancaster bombing operations, and flew seven sorties to various German cities before the raid on Düsseldorf. Reid was a 21-year-old acting flight lieutenant serving in 61 Squadron when he took part in the raid which led to the award of his VC. tailplane had been lost. He decided to carry on, rather than turn back. Reid modestly claimed that his main reason for pressing on was that turning back would have involved flying through or across the following bomber stream, with a real danger of mid-air collision. Pressing on a further 200 miles to his target, Reid released the bombs, then set course for home. On the way back to Syerston, he saw the searchlights of RAF Shipdham, a USAAF-operated base in Norfolk. Despite being wounded and suffering from loss of blood, Reid succeeded in landing his plane - though the undercarriage collapsed and the aircraft slid along the runway. The wireless operator died in Shipdham's medical centre but the rest of the crew survived. fuselage, severing all control cables and fatally weakening its structure, and Reid gave the order to bail out. As members of his crew scrambled out, the plane went into a dive, pinning Reid to his seat. Reaching overhead, he managed to release the escape hatch panel and struggled out just as the Lancaster broke in two. He landed heavily by parachute, breaking his arm in the fall. Within an hour he was captured by a German patrol and taken prisoner. After various transfers, he ended the war in Stalag III-A prisoner of war camp at Luckenwalde, west of Berlin. Norman Jackson joined the RAF Volunteer Reserve in 1939 and originally served as a Classified Fitter IIE (engines). In January 1941, he was assigned to a Sunderland flying boat squadron based in Freetown, Sierra Leone. He applied for retraining as a flight engineer and returned to England in September 1942. On 28 July 1943, he joined No. 106 Squadron which operated Avro Lancaster bombers. Jackson completed his tour of 30 missions on 24 April 1944, but, as he had flown one sortie with a different crew, he chose to fly once more so that he and his original aircrew could finish their tour together. Jackson's 31st mission was a raid on the German ball bearing factories at Schweinfurt on the night of 26–27 April. Having bombed the target, Jackson's Lancaster was attacked by a German night fighter and a fuel tank in the starboard wing caught fire. Jackson, already wounded from shell splinters, strapped on a parachute and equipped himself with a fire extinguisher before climbing out of the aircraft and onto the wing, whilst the aeroplane was flying at 140 miles per hour, in order to put out the fire. He gripped the air intake on the leading edge of the wing with one hand, and fought the fire with the other. The flames seared his hands, face, and clothes. The fighter returned and hit the bomber with a burst of gunfire that sent two bullets into his legs. The burst also swept him off the wing. He fell 20,000 feet, but his smouldering and holed parachute worked well enough to save his life. He suffered further injuries upon landing, including a broken ankle, but managed to crawl to a nearby German village the next morning, where he was paraded through the street. He spent 10 months recovering in hospital before being transferred to the Stalag IX-C prisoner of war camp. He made two escape attempts, the second of which was successful as he made contact with a unit of the US Third Army.